Product #17443 | SKU BRC300P | 0.0 (no ratings yet) Thanks for your rating! 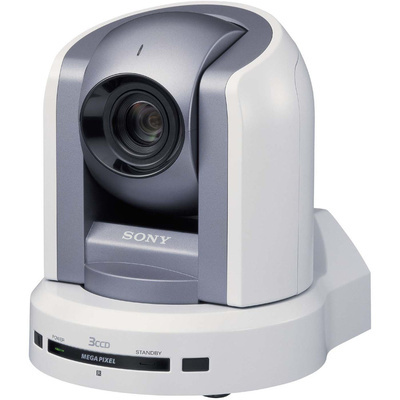 The Sony remote control camera BRC-300, is a 3-CCD communications camera mounted on a pan and tilt mechanism. The superior quality of the video resulting from the 3-CCDs and the choice between conventional or widescreen video output makes this camera quite advanced. With the refinement in CCD development, it has over 1 million pixels at its disposal. The camera can be mounted upside down, like from a ceiling or right-side-up because it has a image-flip function. The BRC-300 is a highly advanced design full motion video camera for remote education and conferencing application, just to mention a few. The million pixels from the 3-CCD design result in superior colour, contrast and detail qualities rivalling the very best pro-sumer camcorders. If your presentations require or deserve the very finest detail, the BRC-300 is just the ticket. Meeting the demands of the newest widescreen monitors and digital projectors, the camera can actually output a native widescreen image without using mathematical interpolation or aspherical image shaping. It provides real widescreen 16:9 ratio pictures with that extra wide angle fitting more into your frame. The camera can be controlled to a good extent with the included IR wireless remote unit. Taking it a step further, an optional RM-BR300 controller has joystick control over other pan and tilt movements, Lens zoom, iris and shutter control and preset camera and lens positions. An optical multiplex unit gives long-distance fibre-optic cable video out and control to the camera up to about 1500 feet. The standard wireless remote performs many basic functions that may be adequate for a single or small multi-camera system. The remote will control up to 3 cameras with individual presets. Pan and tilt, focus and zoom, exposure control and up to 6 preset camera and lens positions can be operated in this way. The zoom function even has a slow and fast selection. The BRC-300 has an accessory slot to accommodate option cards for higher quality video enough for broadcast or for long distance cable runs. For extra-long stretches of cable the fibre-optic multiplexer BRBK-303 runs video and control data through glass cables up to 1500 feet. Analogue component video or RGB data can be output via the BRBK-301. For the very highest quality video, good enough for broadcast or cable television, the camera accepts the BRBK-302 card which supplies uncompressed SDI video.